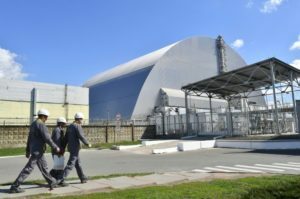 Deloitte Touche Japan and Green Power Development Japan (both based in Japan) are interested in building solar power plants with the capacity of up to 1.2 GW in the Chornobyl exclusion zone. This information was made public at a meeting of Olha Buslavets, the Director General of the Energy Markets Directorate of the Ministry of Energy and Coal Industry, Masatoshi Nishimoto, the Director of Deloitte Touche Japan, the Executive Director of Green Power Development Japan, and representatives of the Japanese government in Kyiv on January 30. According to the press service of the ministry, during the meeting the parties discussed the economic and technical aspects of construction of solar plants, as well as a draft law on the introduction of “green” auctions. As reported, the construction of a pilot solar plant with a capacity of 1 MW of the Enerparc AG-Rodina Energy Group consortium was completed in early 2018. In the autumn of 2018, the consortium announced its intention to increase the station’s capacity to 100 MW.